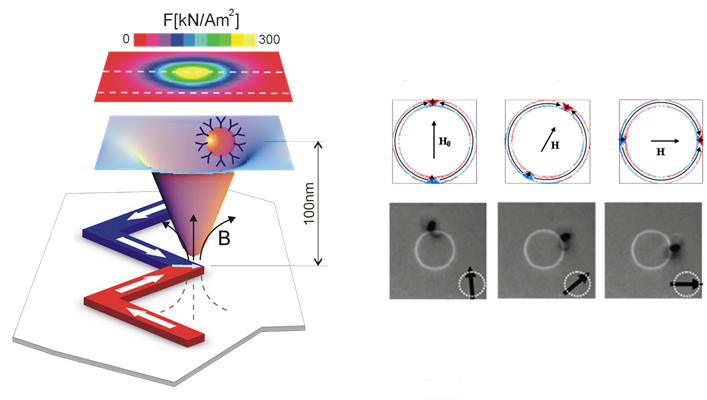 Single molecule imaging and handling are of relevance for in-vitro biological application, because they offer a clear and direct way to investigate functions and dynamics of single cells or biomolecules. Methods based on the remote manipulation of magnetic particles are receiving great attention because they allow a controlled and highly localized stimulations of cells and bioentities. In this field, the manipulation of magnetic beads via magnetic domain wall tweezers (DWTs) is a considerable approach; it is based on thecontrolled motion of magnetic domain walls in Ni80Fe20 conduits which can trap and drag particles in suspension. DWTs are a non-invasive technique, not involving a relevant energy dissipation which couldeventually damage the cell structure. Furthermore, DWTs allow an extremely high spatial resolution (down to 100 nm) and multiplexing capability. The application of controlled forces to activate specific bio-pathways and investigate their effects, mimicking the role of the cellular environment, is becoming a prominent approach in the field of mechanobiology. In this framework, magnetic on-chip platforms equipped with DWTs allow to mechanically or chemically stimulate the cellular membrane, by manipulating magnetic nanoparticles on nanometric magnetic conduits patterned on-chip. The interaction force exerted by the magnetic beads onthe cellular membrane can be tuned in the pN-nN range, applying a variable external magnetic field.